A significant percentage of those aged 65 and over live with a group of disorders known collectively as dementia, an irreversible and progressive decline in cognitivefunction beyond that expected from normal ageing. In 2013, 44 million people worldwide were affected, and this figure is projected to reach 135 million by the year 2050. However, due to busy schedules, caregivers are unable to provide everyone in their charge with as much personal attention as they would like. This reduction in stimulation and social contact can result in monotony and concomitant boredom, loneliness, agitation and even aggression. 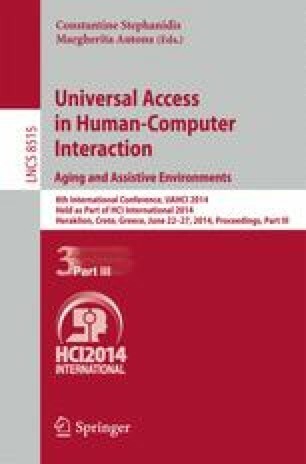 This paper provides information on the progress and process of research conducted between 2011 and early 2014, directed at developing ‘Memory Box’; a personalised multimedia device, which can be used independently by individuals with dementia, to access their favourite music, videos, photographs and pre-recorded messages from family members.